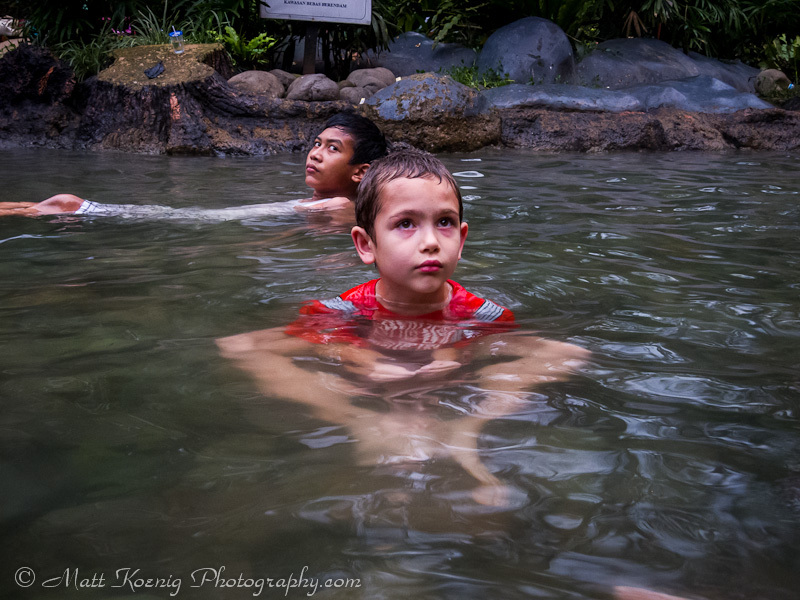 Soaking in the hot mineral water at Ciater Hot Spring Lembang Indonesia. 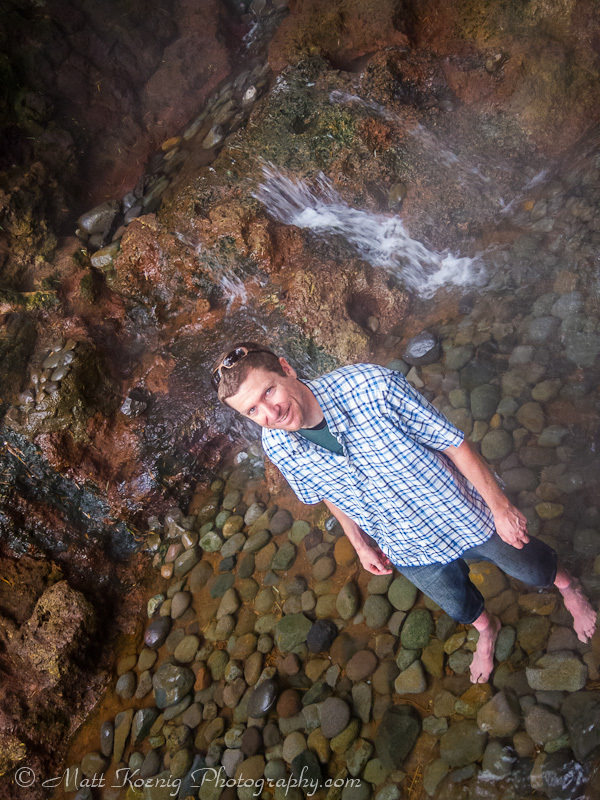 After parking we made our way down a pathway and discovered a small pool where you could soak your feet. Inside the small pool was a stone seating area with a smaller pool. As we soon learned the smaller pool contained really hot water. We took off our shoes and waded into the pool. The water was warm and inviting. We made our way to the smaller pool and seating area and were warned that the water was “panas sekali” or really hot. One guy sitting there said to submerge your feet slowly and then don’t move. If you move the water just feels hotter. I decided to take the plunge and slowly submerged my feet into the water. It was indeed incredibly hot but once your feet and legs adjusted to the intense heat it felt really good. And just as we were told, if you didn’t move it was very pleasant. It was nice just sitting there soaking and a bit fun to watch others venture over and see who would plunge their feet in and who would attempt but turn away with painful expressions on their face. 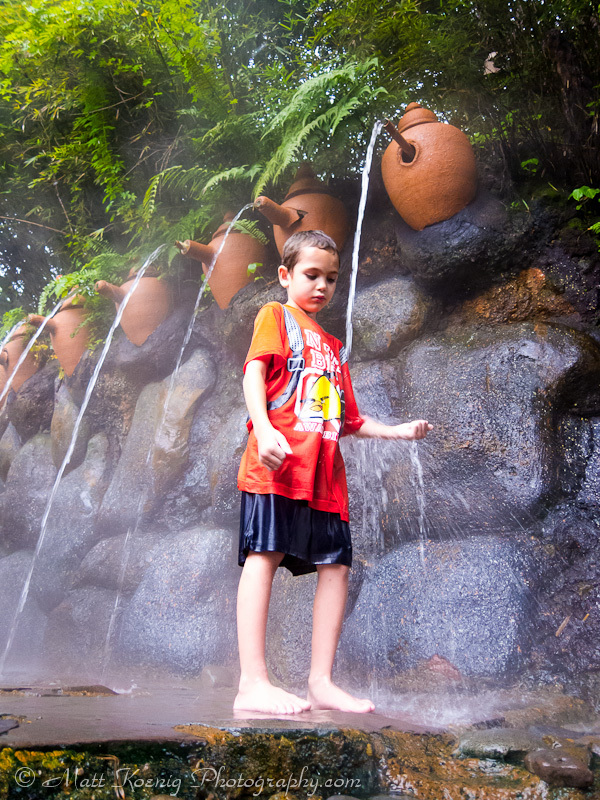 We soaked for 15-20 minutes washing out legs and arms with the mineral rich waters. It felt really good. 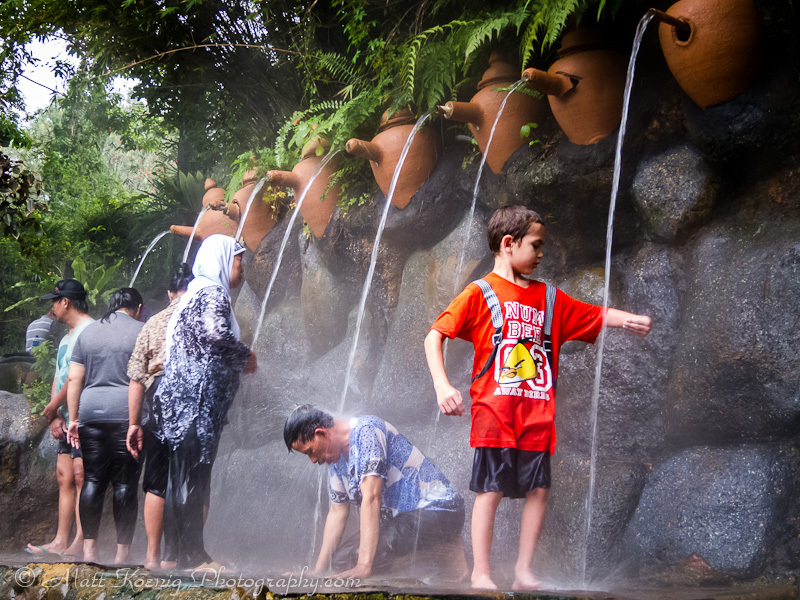 The temperature of the water at Ciater Hot Spring ranges from 34C to 46C. Here is a short video of us soaking. When we finally emerged from the pool our skin was bright red and you could clearly see a red line demarking where the water level had been. A guy approached and said the redness was a good thing as it indicated good health. If you emerge and your legs and feet are bluish then you might want to schedule a visit with your doctor. I will count my freakishly red legs as a blessing. 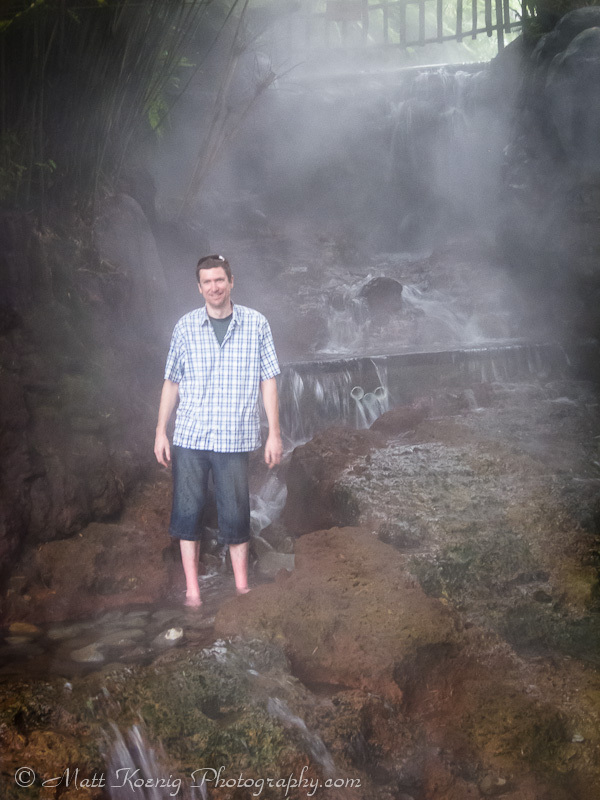 The water was so hot and in some spots almost too hot for comfort. From here we walked further down the path and discovered that the Ciater Hot Spring is much more than a few pools of hot water. 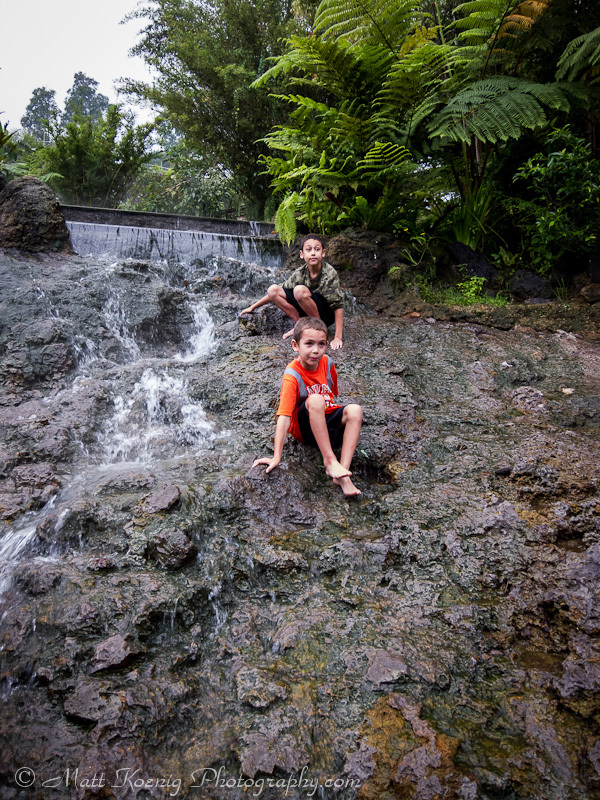 It’s actually comprised of pools, streams, rivers and waterfalls all flowing with volcanic heated mineral water. Both my kids loved it. At times it was hard to walk on the cobblestone bottom of the pools and streams as it was a little rough on my untrained feet but you soon get used to it and it becomes more of a massage than torture. My son enjoying the warm mineral waters and having a great time. There is also a pool that you can swim in if you want to purchase tickets at around RP20.000 ($2USD) per person or there are private soaking rooms at RP40.000 ($4USD) per person. We were having too much fun in the “free” areas that we didn’t bother swimming or a private soak. Overall it was a great day and a fantastic experience. 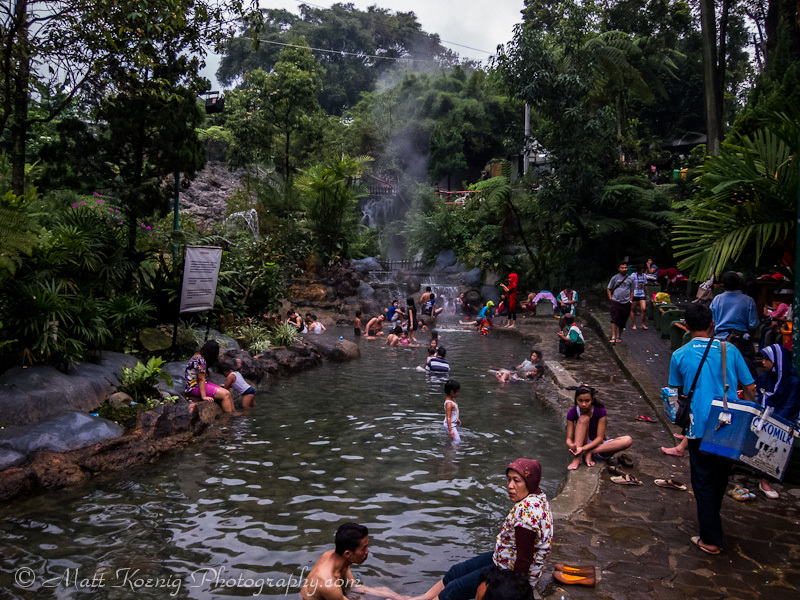 We are already planning our next visit to Ciater Hot Spring. I didn’t take my big fancy camera(s) this time so all of these photos were taken with the Canon S90 which is a nice compact pocket camera but does have some noise issues at higher ISO. It is however, much easier to pack around than the Canon 5D Mark II.